Hoffman at the 2008 Cannes Film Festival. 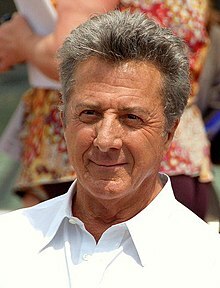 Dustin Lee Hoffman (born August 8, 1937) is an American actor with a career in film, television, and theatre since 1960. He has been known for his versatile portrayals of antiheroes and vulnerable types of characters. The plight of the actor, even if he's a star, is the plight of the women's movement. They're saying the same thing to us: get into bed, give me a good time, then give me something to eat, go get the laundry, be a good girl. Interview, Films Illustrated, May-June 1980. This page was last edited on 13 August 2018, at 17:54.